When I walk in Tipperary I always come home with something. Sometimes it is a horse chestnut, or an apple or some blackberries. It might be a handful of wild garlic. It might be a fallen branch with lichen attached. I might bring a fern or a flower, news of an escaped heifer or a report on the depth of the mud in Joe’s lower field. I might come home with a dog. I often return with a dog and these days it is usually Oscar. We walk and talk. He has a drink of water and a sniff around on arrival and then he heads off home. Walking in the city is not the same. I have never collected a dog on a city walk. A large amount of urban movement seems to be about buying things. 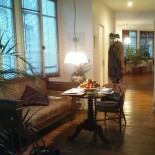 It is interesting to move through the city without buying things. If I lived here all the time I would probably start to make things out of cardboard. There is an endless supply of great cardboard out on the sidewalks. Big strong pieces of cardboard and boxes of all shapes and many tubes. There is so much choice and as long as it is not raining it is all in fine and useable condition. I do not return home with the plentiful cardboard but I do return with wooden boxes. So far I have collected two small shallow cheese boxes and a fine cigar box with a hinged lid. 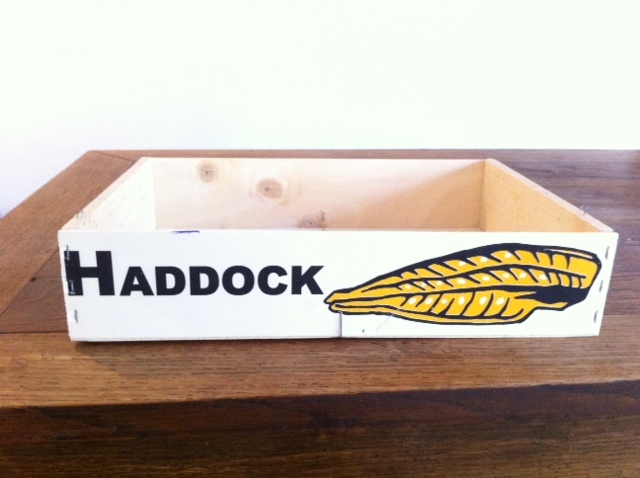 The biggest thing is the Haddock Box. I did not need this box but the screened image of a slab of smoked haddock on the side was too good to pass up. The big H on the Haddock is clunky but commanding. Of course, the box smelled of its former contents. I soaked it in the bathtub for a day. It is now dry and odour-free. I am using it to hold drawings. There are only a few in the bottom so in order to fill it up I need to get drawing. The apartment whose tenants moved out last week had people visiting last night. A very dim light was visible in the back, maybe in a hallway, and probably the only lightbulb in the place. Of course there are no curtains. The curtains went with the former residents. Two people were in there for an hour or more moving around and exploring the empty apartment by flashlight. I guess they were making plans for their new home. This entry was posted on February 17, 2016 by ericavanhorn.